This spring we were very fortunate to have Changling Rinpoche come to Nova Scotia to visit, teach, and translate. Changling Rinpoche is in charge of teaching the ritual and ceremonial traditions to the monks at Shechen Monastery, the monastic seat Dilgo Khyentse Rinpoche founded in Nepal, and he is a close associate of Rabjam Rinpoche, the head of the monastery. Rinpoche came to Dorje Denma Ling to teach one of Trungpa Rinpoche’s root teacher’s texts: Khenpo Gangshar’s Naturally Liberating Whatever You Meet. 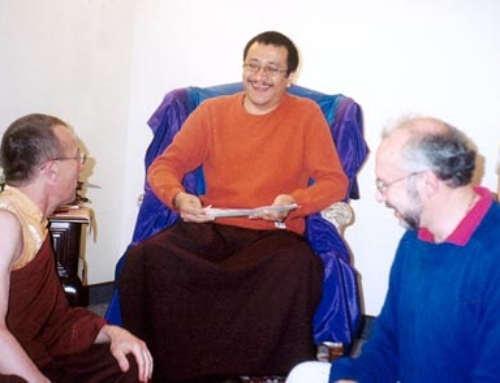 While Rinpoche was teaching at DDL, we met with him on the “Confession Liturgy That Brings Reconciliation with the Jnanadevas,” from The Undefiled Supreme Wisdom Tantra. We had translated this long ago, at the request of Dilgo Khyentse Rinpoche, for our sangha to practice as a means to repair our samaya (vajrayana commitment) with Trungpa Rinpoche. Since then, we have come to understand this to be a very profound text with a variety of commentaries, including one by Jigme Lingpa. And so we amassed quite a number of further questions on its meaning and expression. It was a unique opportunity to work with Changling Rinpoche. Not only does he have a deep understanding of the tradition and its meaning, but he also truly enjoys delving into its expression in English. He is a consummate educator, so it was a delight to work with him. We look forward to his return to complete the teaching of Khenpo Gangshar’s text next year. We would like to offer you the following brief “fly-on-the-wall” perspective of what it is like to be in a translation meeting with a learned, bilingual Tibetan lama. 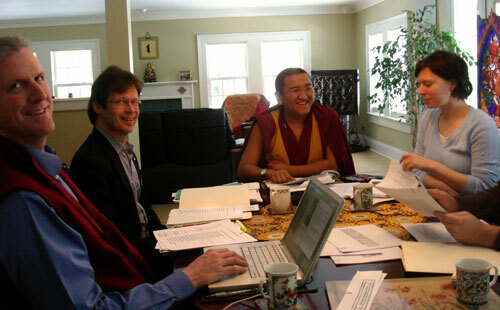 In the transcribed discussion below, in addition to Changling Rinpoche (CR), Scott Wellenbach (SW), Mark Nowakowski (MN), Patricia Kirigin (PK), and Walker Blaine (WB) are present. This portion of the meeting focuses on the first verse and primarily on the meaning of the words rangshin (rang bzhin, “self-existing”) and tröpa (spros pa, “elaboration”). Is like the full moon and has no elaboration. Its compassion appears equally for all, like the light of the luminous sun. Please approach here, consider us, and take your seat. CR: I have one question. Are you translating rangshin as “self-existing”? SW: Yes, that’s the way we’ve translated it. CR: For me, rangshin means something more like “naturally” or “natural.” “Self-existing” sounds like someone is there doing something. SW: Is it that “the supreme wisdom body” is “the natural mandala”? CR: Yes. The reason I don’t like “self-existing” is because “existing” is used a lot in madhyamaka. In many traditions, that is the main point to be refuted. So “self-existing” sounds like that. SW: So perhaps we could say, “The supreme wisdom body, the natural mandala”? CR: When I see rangshin, I immediately understand “naturally,” without any causes or conditions, unobstructedly appearing from beginingless time. MN: Is this the same as in rangjung (“self-born”) or rang-nang (“self-appearance”)? CR: No. Actually, rangshin can be understood in many ways. Sometimes, it can be understood as “self-existing.” But in this case, I understand it as naturally, unobstructedly appearing, without any cause or condition. PK: How about “appearing” instead of “existing”? [laughs]. Since some people do not have a lot of training and knowledge, we have to be careful when translating a word, so that it does not cause misunderstanding. MN: So did we decide on “naturally”? 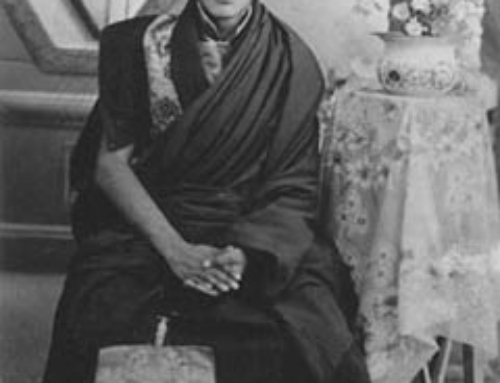 CR: By reading Jigme Lingpa’s commentary, I understand rangshin as naturally, unobstructedly appearing, without cause or condition, from beginingless time. “Natural mandala” means that we have two mandalas: a conditioned mandala and an unconditioned mandala. “Natural mandala” refers to the unconditioned mandala. So “self-existing” does not fit very well. “Unconditioned mandala” means that it arises without causes and conditions. It is not necessarily self-existing. SW: That is a great commentary, but we’re a little shy about putting too much commentary into the translation. We could say “natural” or “naturally appearing” and add the rest in a commentary. CR: Jigme Lingpa also refers to it as the “unfabricated, great natural mandala.” Here, “unfabricated” means the same as “unconditioned,” not made by causes and conditions. CR: Here, tröpa is not “elaboration.” It means trötral (spros bral). How do you translate trötral? SW: Trungpa Rinpoche used to like to say “simplicity.” We often say that, but sometimes we feel it doesn’t work. We also say “free from elaborations” or “free from complexities.” But when “simplicity” fits and it sounds nice, we use it. CR: It does not only mean “no thoughts.” It can also mean not to fall into some particular stage or level. In this case, it can be understood as free from all dualities: conceptual thoughts, falling into samsara or nirvara, existence or nonexistence, and so on. MN: Elaborate is the opposite of simple. You can say something in either a simple way or an elaborate way, with lots and lots of things. For example, a big feast is an elaborate feast. CR: The translation says, “It is like the full moon and has no elaboration.” This means that it is just like a full moon, clarity, but it is free from tröpa, which means free from effort, which is simplicity. MN: I think “free from elaboration” works with the image of the moon. “Free of extremes” does not really work. CR: Now let’s pretend we are total beginners and don’t know what this means. If we say, “It is like the full moon and has no elaboration,” how would you understand that? MN: It sounds simple, with nothing extra around it. But it still doesn’t quite work. It sounds like the moon is free of anything extra—no clouds, no junk. PK: I would think simple, simplicity. WB: As a beginner, I just thought it meant the moon: this bright clear moon and nothing extra. MN: Our translation says “no elaboration,” singular, which technically means that there is no talking about it. But “free from elaborations” means there is no stuff around it. If I “elaborate” on something, I talk a lot about it. SW: Well, that’s one meaning. MN: I’m thinking from a beginner’s point of view. MN: Maybe we should say “simple” for the full moon, and then we could add commentary. For example, at the full moon, the moon is free from sides. It does not have a bright side or a dark side. Similarly, it is free from the extremes of apprehending subject and apprehended object. For me, “elaboration” sounds more like the Tibetan word gye-trö (rgyas spros) than the word tröpa. Gye means “to elaborate,” so “elaboration” sounds more like gye-trö. PK: So the image of the full moon means that nothing is hidden, that you can see the whole moon. Peace, the pacification of complexity . . .
Can you explain the word “complexity”? SW: It is the opposite of simple. SW: Are you suggesting that in Nagarjuna’s homage, tröpa means “extremes” rather than “complexity”? SW: In Nagarjuna, I think “free of extremes” works well. But when I hear “the moon free from extremes,” I think it is neither bright nor not bright, and I don’t know if that’s the right idea. CR: I was thinking “free from complexity,” something like that. SW: Here, “free from complexity” might work? MN: But the image of the full moon is simple. That’s the nice thing about saying “simplicity”—it’s simple. But “the full moon, free from complexity” makes your mind spin. SW: It’s a negative statement. MN: Well, that’s the beauty of translation. WB: It seems important to retain the negative in the translation, because you’re contrasting the negative in this line with the positive in the next line. MN: But if we add “yet” or “but” at the beginning of the second line, the negative is included. WB: But the tantra uses a negative rather than a positive. SW: Rinpoche, in this line about the full moon, is it just saying that its quality is no complexity? Or is it like the full moon in other ways as well? Our present translation says, “It is like the full moon and has no elaboration.” “And” implies that there are other qualities. CR: The Tibetan means, “Like the full moon, there are no complexities.” If there were an “and,” the Tibetan would need to have the word “tang” (dang). CR: Anything you say [laughs].